oops! break a leg Spidey! again……. Spiderman, Spiderman, friendly neighborhood Spiderman. Catches thieves just like flies, breaks a leg from the skies – lookout! here comes the ‘deadly’ Spiderman. 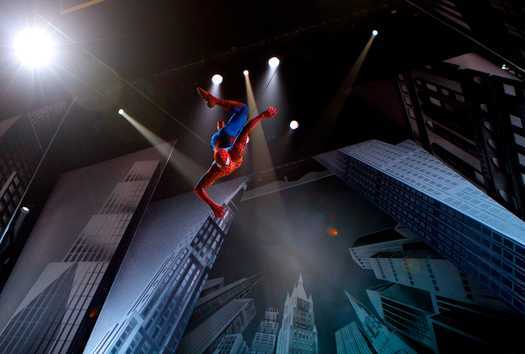 Another actor has been sent to the hospital due to an injury, disrupting another preview performance of the mega-budget musical”Spiderman: Turn Off The Dark”. The show was halted 7 minutes before the finale because an actor (stuntman not star) in a Spidey costume fell off a platform into the pit. I so wish I was seeing these previews, it would be like watching a bullfight! What happened after the fall? If you had paid to see the show, how would you know how it ended? Did director Julie Taymor send a gift pack to the hospital? Was Nurse Jackie in attendance? Note to writers of Nurse Jackie – cross promote, add a plotline into the new season – what a hoot that would be. By the way, I love Julie Taymor.